We attended the WPCSA AGM, which was held in Raleigh NC this year. There were many new faces this year, lots of wonderful new people to meet, and of course, all the old "regulars" who have become such good friends over the years. Attending the AGM has always been a high point in our Welsh year, and this was no different. David was presented a Lifetime Acheivement Award for his service as a volunteer and all the work he has done (and continues to do!) to bring the stud books up-to-date. For awards, it was our biggest year yet, with Hi Point awards and Lifetime awards presented to several of our ponies. Our senior sire, *CEULAN LWCUS LOM/AOE/OD, was awarded his first Sire OD and was once again the Top Siring Section A Stallion for 2011, and was in fact the 2nd place sire overall for the year. Dam LOM's were awarded to two of our favorite mares, *CEULAN LORELEI LOM and GASLIGHT SIWGR BABY LOM. 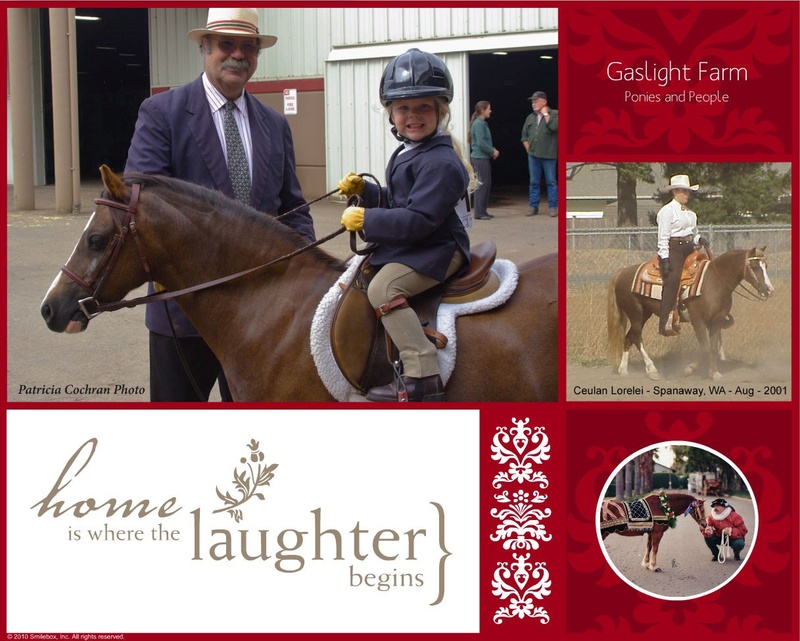 Lwcus' first Section C offspring, GASLIGHT AMBER LOM was awarded an Individual LOM, which she completed at age 3 years, in her first year green under saddle. Having done so well in halter for her first 3 years, and being expertly trained and shown by Carrie MacWhorter, completing the 500 performance points was easy for her! Amber also ended 2011 as the Hi Point Champion Section C Mare and in C/D Western Pleasure, and Reserve Hi Point Champion in C/D English Pleasure and Adult Trail. Considering that she only started showing English and trail midway through the year, and that she was not far behind the leader in English and only 1 point behind in Trail, we think her Reserves were pretty impressive! *Ceulan Cappuccino arrived home to our farm at 0130 this morning. He had left Wales at the end of October, flew out of Amsterdam to Toronto, and cleared quarantine on Nov 11th. He has been on the transport almost 2 weeks, but didn't look any worse for the wear. He has the same gentle dispostion that we saw in Wales, and he acts like he's glad to be back on green pastures where he can move around! Hallowe'en is very different up here on the farm. Ben and Shannon dressed the kids up and took them to a residential area so that they can do Trick'r'Treating. We would have missed so much if they hadn't come to live with us on the farm! Bub (Nathan) on the left is 3 now, and Haley is 5. We have known for a long time that we will need an out-cross stallion to use on our Lwcus daughters, but had not been looking yet. I think Dr. Wynne has ESP or something, because we received an email from him last month, letting us know that head 2 colts this year that he felt were the nicest since Lwcus. We weren't really ready to consider importing yet, but I looked at them. They were nice, but didn't make my heart sing the way Lwcus did when I saw his picture 18 years ago. Then I received another email from Dr. Wynne, offering us a yearling colt that his son, David, had retained to show. I had the same gut response to Cappuccino's picture that I had had to seeing a photo of Lwcus for the first time. A deal was struck, pending having the chance to evaluate him -- especially his disposition-- when we came for the Royal Welsh show again. We loved what we saw, loved his disposition, and this colt will be coming to Oregon some time in November. On a different note, the RW show was great, as always. We seem to have an affinity for being somewhere in the grandstands whenever there is a photographer present. Dr. Wynne sent us this picture of one of the driving classes. If you look VERY closely, in the middle of the picture, David (in a blue jacket) is sitting in the 2nd row, behind the lady in the red coat, and I am sitting 2 seats to his right, also in a blue jacket. Isn't that pony a spectacular mover? Another year has passed, and yes, the house in SoCA is still on the market. Darci and a friend are living there, so it's not empty. She came up for Christmas again this year and this time, we had a little snow on 3 of the days she was here. It doesn't last long, but it sure is pretty! Our card says it all! Thank you, Pat Cochran, for the wonderful picture of David, Haley and *Ceulan Lynette! It was a very sad day today. We made the difficult decision to put our wonderful *Ceulan Lorelei down today. She was such a phenomenal performer before being his with severe laminitis, and never fully recovered. She was able to give us 2 more foals, including the filly we wanted in 2008 and a final colt this year. It had been along and difficult winter last year, and we decided not to breed her again. Though she had not lost the twinkle in her eye, we couldn't subject her to another bad winter. She will be missed terribly by all of us at Gaslight Farm, and anyone who knew this wonderful mare. Lorelei with Darci at the Spanaway show in WA in 2001, her last show. Darci spent Christmas with us on the farm this year. I was hoping there'd be some snow for her, but we haven't had any. There has been a lot of rain, but not cold enough for snow. Last winter, during my first winter up here, we had a week of single-digit days to contend with. We had to carry buckets of hot water fromthe house to the barn and break up the ice on the waterers. It was quite a new experience for all of us, having lived our entire lives in sunny SoCA! After the freeze passed, we discovered that all the pipes in the barn had broken. David got them all repaired and put heating cables on them and heaters in the waterers, so we are more prepared for this if it happens again. A lot has happened for me in the last few months. I found a wonderful job in Oregon, working entirely telephonically from my home. After 40+ years of commuting to hospitals, I think I have a dream job! Roll out of bed, log on, and I'm at work! I attended a training session in Boston in the middle of June, then came home, packed up, and was on my way to the farm by the end of the month. We cut and baled our first crop of hay. Having purchased every morsel of food our ponies consumed in SoCA, it is so incredibly satisfying to see a barn stuffed to the rafters with hay we produced ourselves. In July, we made our annual trip to Wales for the Royal Welsh show. I am settling into the routine, and thoroughly enjoying looking out the windows by my desk and seeing ponies roaming in the pastures, or hearing the little grandkids outside playing. What a joy! It took a month or two, but all of our ponies are now feeling confident to leave the safety of the barn overhang and venture out onto the grass. Ben found it intensely amusing to watch them stare out at the grass and not know what to do with it or the free area to roam on! He siad our "city ponies" have finally adjusted, and are at least enjoying their new freedom. David moved our son and his family out of AZ and up to the farm this month. He now has more family in OR than down here, so now he has someone to go home to when he leaves here. When he was alone on the farm, his heart was with me, but now the farm is his home. David has moved all the ponies out of Yorba Linda, both of the dogs, the parrot, all of the chickens and barn cats, and left me with just 2 house cats. It is VERY quiet here now. The house is pretty empty, most of our furniture is gone, so things echo. Darci and I are keeping things going down here, hoping for a quick sale so that I can join them on the farm as soon as possible. We put our house on the market a month ago but there hasn't been much activity. I think the turn in the economy is going to make it difficult to sell our home, but hopefully I am wrong! David has made two trips up and back to the farm already. He is home in Yorba Linda for Christmas and already packing more boxes and small furniture into the horse trailer for his next run. It is 850 miles each way and takes him 2 days. This will likely be the last time the family is spending Christmas together in our YL home. Next year should be ther first year we spend it on the farm. The kids' lease is up on their AZ place next month, so they are getting everything packed so that David can help move it all to the farm in January. We finally closed escrow on the Oregon farm the day before Thanksgiving. The September crash in the economy wreaked havoc with the lenders and delayed closing, but it is now complete. David will be leaving next week to begin moving boxes and taking stock of what he needs to do to prepare for moving himself and Ben and family up in January. It is hard to believe that the year is almost over. Our biggest news is that David retired in April, a couple of years earlier than he had planned, and with that change, our plans to relocate to a rural farm escalated. 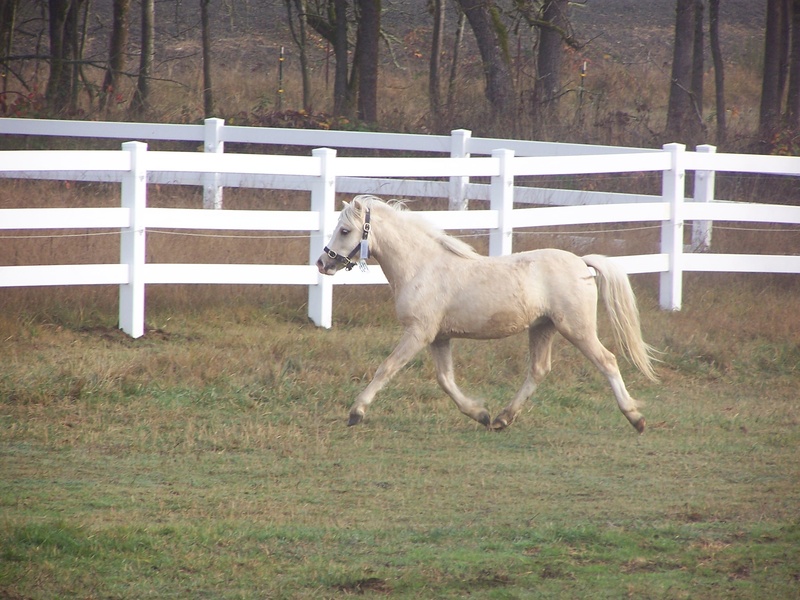 We are thrilled to announce that we have purchased a 38+ acre farm in Roseburg, OR, and will begin moving all the ponies and other critters to that location in January. David will move up the second week in November, right after the last shows of the year. Our son, Ben, and his family will be moving up to join him in January. I will remain in Southern California until our house in this location sells. Once that is done, I will join them in OR. Darci will remain in California, as her job will not transfer. We are hoping that, in time, she will be able to move to "God's Country" with us! We are back from our annual trip to Wales for the Royal Welsh Agricultural Show. This one was a bit more fun than usual for me, as prior to leaving, Jan Mann of the UK contacted me to see if I would be able to groom for her during her ridden cob class. What an honor that was! Seeing the RW from the inside of the arean was exciting, but unfortunately, I didn't bring Jan any luck. Both of her cobs were excused and did not make the final cut. I suspect she'll want someone else next time, someone who can bring her better fortune! Happy New Year to everyone! We have much to celebrate... our foundation Section C mare, *Synod Aurora, ridden all year by a junior, Sidney MacWhorter, has earned the Year End Hi Point Championship for Section C/D Western Pleasure. She was bred for the first time last year, is due to foal this month. We are also anticipating six Section A foals, two of which have already been sold. Our senior stallion, *Ceulan Lwcus, was once again the Leading Section A Sire for another year, and has now earned four of the required progeny "legs" for his Sire LOM, also very close to getting a Sire AOE, due to the outstanding show record of his oldest get, Gaslight Chwyrlwynt LOM/AOE. We expect him to finish the requirements for those two Lifetime Sire awards this year. 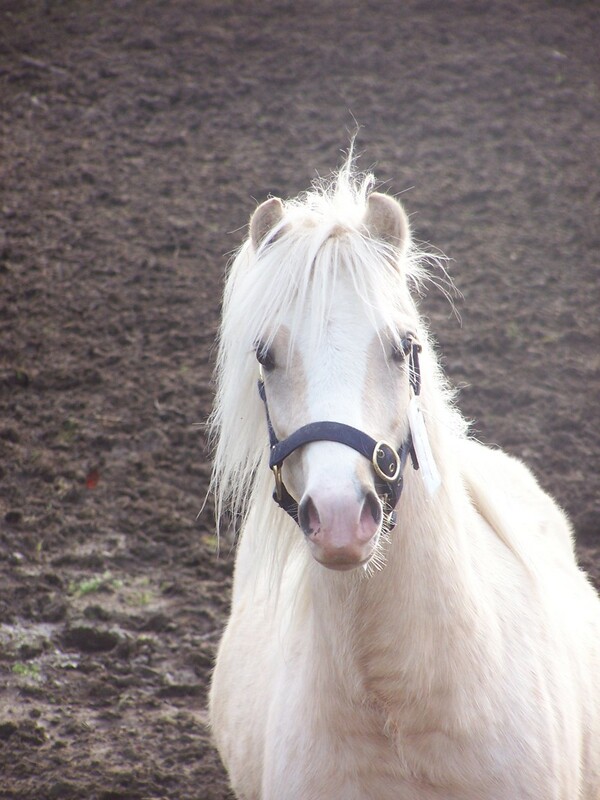 Our foundation mare, Chaparral's Crystal, will be awarded her Dam AOE at the AGM next month. She is currently the leading Section A Dam of all time. Her 3rd and final "leg" for the Dam LOM is likely to be earned in 2008. This entry HAS to have a picture! My "maiden voyage" driving Rocky in a show was last week, at the California Sunshine Warm-Up and Classic. I was PROUDLY last place in almost all the classes, though I managed to beat David with our 17yo mare, Gaslight Siwgr Baby, in a couple carriage classes. The fact that he took the little Wilform and let me have the fancy Buckeye helped those placings, without a doubt! But since no one believed I would actually drive him (they all thought I would chicken out), getting in the classes and having a GREAT experience was the goal for the show. Again, Rocky was quiet and responsive, no studdy behavior or calling whatsoever. If it wasn't for the inconsistent speeds of his gaits (driver error, for sure! ), people did not believe he was so yung and so green. Yes, Lwcus can be proud of his son, and how well Rocky "took care of" his green driver! Gaslight Shamrock, green-broke to cart and my first show in harness with him... I am having a blast! 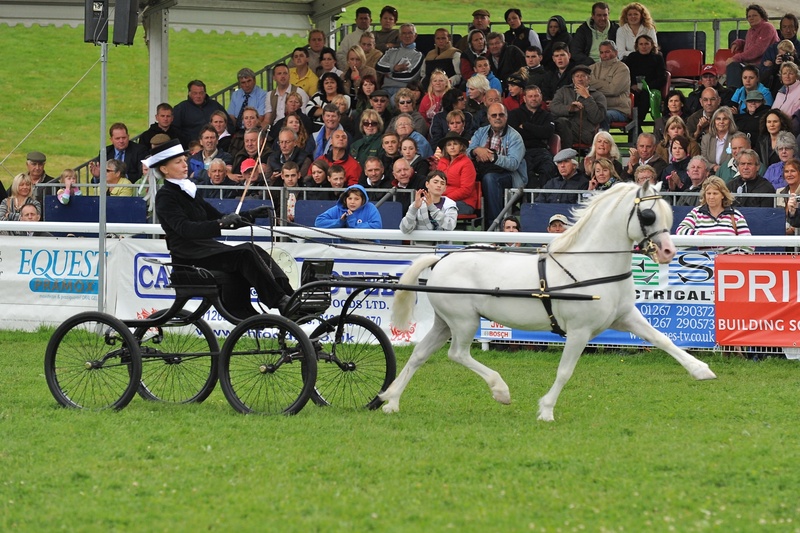 We just got back from out annual trip to the UK, to attend the Royal Welsh Agricultural Show in Builth Wells, Wales. It was a great trip, lots of fun, as usual, visiting with the many friends we have made through the years, attending this show, including seeing several of our American friends who also make the trip each year. 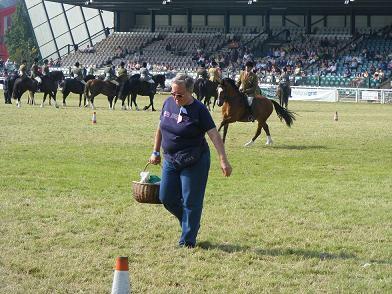 The best thing about these Welsh Ponies and Cobs are the people you meet while enjoying them! If you ever have the chance to go to the RW, I encourage you to make the trip. Nowhere in the world will you see so many Welsh in one show! Now to prepare for the show in just two more days! I haven't driven Rocky since before we left, and this will be my first experience on my own in the ring. My first class will be on our 34th wedding anniversary....! Our first show of the season at the beginning of this month turned out to be more fun than usual. Our young stallion was ready to be returned to us, having been broke to cart by Gerald Verkuyl of Goldhills Welsh in Elk Grove, CA. Gerald brought Rocky to the show, took him out for some practice in the warm-up arena, then gave me some driving lessons. I was impressed with how well-trained and sensible he was already, having been hitched only a few months. In spite of all the distractions at the show and in the practice arena-- ponies taking practice jumps, riders cutting in and out, lots of MARES he had never seen-- Rocky was quiet, attentive and responsive, never called out, never lost attention to Gerald, never spooked. Gerald then took him in three Pleasure Driving classes, and managed to earn the Division Reserve Championship with him! Gerald plans to drive him again for me at the Sata Barbara show early next month, then after that, I will be on my own. We have five mares confirmed in foal, with three more pending breeding or confirmation. After the "quiet" two years of minimal foals, 2008 is going to arrive with a bang! Our first will be due in January. The WPCSA AGM is now past... I want to thank all the members who had trust in me and who voted in the election to make me one of your Directors. It was an awesome-- and humbling-- experience to know that I had the highest number of votes, and to realize that now the HARD part starts... working on behalf of the membership to fullfill that confidence. Again, thank you to all. We are leaving this morning for the UK, destination Builth Wells, Wales, and the Cob Sales. It is another "looking" expedition, a wonderful, relaxing break and a chance to see friends and lots of C ponies to consider buying. We will return on the 24th. Any messages sent to us while we are gone will be answered as quickly as possible upon our return. Congratulations are now officially due to Carrie MacWhorter, for all the work and time she spent, training and completing with her Section A mare, GASLIGHT CHWYRLWYNT (pronounced like "whirlwind" in Welsh, and means the same). "Wendy" now has completed both her Individual LOM and her Individual AOE. We are especially thrilled, because this is the first Lifetime award earned by one of our home-bred ponies. "Wendy" was the first foal produced by our senior stallion, *CEULAN LWCUS, out of our foundation mare, CHAPARRAL'S CRYSTAL. We have retained two full sisters, who will be shown and hopefully complete their dam's LOM soon. Congratualtions again, Carrie and GASLIGHT CHWYRLWYNT, and thank you for bringing those two awards home in the Centennial Year for the WPCSA. The Brookside and WW Nationals in NoCA are now behind us. Held back-to-back, it was the first of this combined format that has been held in California. It was a great success, generally appreciated by exhibitors who are feeling the "crunch" of current gas prices, to be able to show over five days for the cost of one trip. *CEULAN LYDIA also placed well at both shows. At Brookside, she won the broodmare class under both judges and was Champion Section A Mare and Reserve Grand Chamion Section A under judge Schiller and Reserve Champion A Mare under judge Caudle. At the WWNatls, Uk Judge Simon Bigley also made her his 1st in Broodmares and Reserve Champion Section A Mare. GASLIGHT SIWGR BABY, returning for her second and third shows in performance since retiring seven years ago, was consistantly 3rd in all Pleasure Driving classes throughout both shows. What an extrordinary weekend we had at the Inland Welsh Classic in Riverside, a new gold show here in SoCA! We couldn't have asked for nicer August weather, and the facility had a lovely clubhouse with shaded patio and misters overlooking the arena, for those who wanted the extra comfort. Kudos to Carrie Gunn, the organizer of this event, and Carrie MacWhorter, for all they did to make it happen. Thanks also to all the exhibitors who traveled so far to attend--too many to list individually-- who threw in extra ponies to help us reach our numbers for the gold rating. It is once again an example of the special comraderie that Welsh exhibitors have, and how they will extend themselves to help everyone reach their goals. As the closest local breeders with the largest stock of available ponies, it was our responsibility to "dump out the barn" if that was needed. We took 11 ponies, many who were not in show condition and intended as class "fillers," but they all showed well. It was a long halter day, but with the help of so many other exhibitors, who assisted in showing, holding, and generally being patient, we got it all done with minimal gate hold requests. GASLIGHT CRICED and GASLIGHT LONDON FOG, our two year old Section A geldings, repeated their performance at the SB Show last month, going 1st and 2nd under one of the judges, but this time, Criced was named Supreme Champion Gelding and London Fog was Reserve Supreme Gelding! The other judge placed them 3rd and 4th, behind the mature geldings, GASLIGHT SWEET SURRENDER and LARKIN PROMISE KEPT. "Keeper" is a son of our senior stallion, *Ceulan Lwcus, so it was still a "win" for us! Judge Maxwell was impressed with our C mare, *SYNOD AURORA, and placed her 1st in Section C/D Yeld Mares, and Reserve Champion C/D Mare. Darci was thrilled! *CEULAN LYDIA and GASLIGHT CHWYRLWYNT swapped places for 1st in Section A Broodmares, but with *CEULAN LYNETTE as their unanamous choice for 1st in Yeld Mares, Lynette was then awarded Champion and Reserve Champion Section A Mare. Two of our retired performance mares also made appearances in this show. 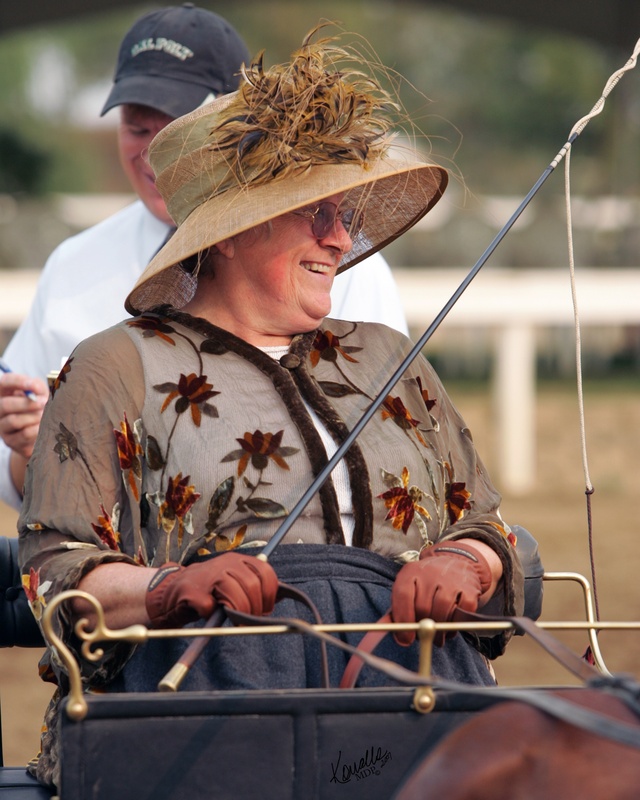 GASLIGHT SIWGR BABY, a 16 year old driving mare who has been retired (and unhitched) for seven years, put in a respectable performance in cart, winning the Pleasre Driving Stakes class and Reserve Champion A/B Pleaure Driving. 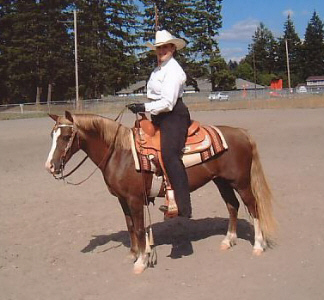 Cindy Dibrino from OR volunteered to ride *CEULAN LYDIA in the English Pleasure classes. Lydia has not been under saddle for four years, and with each class, Lydia improved. Cindy has offered to ride her again at the Western Nationals next month and we are excited at the opportunity. Carrie MacWhorter reports that her mare GASLIGHT CHWYRLWYNT (aka "Wendy") completed the last halter points needed for her individual Legion Of Merit at the SB Nationals show, and then at the show in Eugene, OR, she finished off the last points needed for her Award of Excellence. She will be awarded her LOM and AOE at the WPCSA's AGM and celebration of the Centennary year in February next year. Our two young geldings, GASLIGHT CRICED and GASLIGHT LONDON FOG, were placed 1st and 2nd in Section A 2/Under Geldings under both judges at the Santa Barbara National Horse Show this month. The judges then swapped Champion and Reserve Champion A Gelding between Criced and another homebred gelding, GASLIGHT SWEET SURRENDER, owned by Ingrid Jackson, shown by her daughter, Kristina.